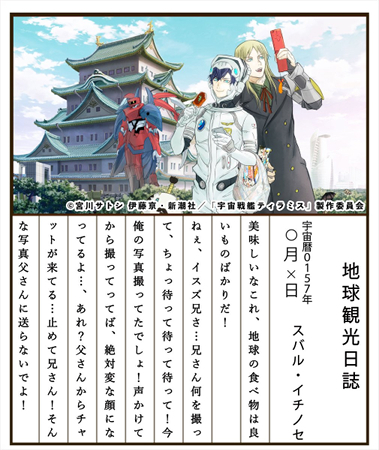 Short series Uchuu Senkan Tiramisù revealed at the end of its 13th and final episode, which was broadcast on June 26, that the series gets a second season. The next season will be titled Uchuu Senkan Tiramisù II (Uchuu Senkan Tiramisù Zwei) and is scheduled to broadcast this fall. A pre-screening event will also take place on September 29. The sci-fi comedy manga Uchuu Senkan Tiramisù is written by Satoshi Miyagawa and drawn by Kei Itou, and has been serialized in Kurage Bunch web magazine since 2015. Shinchosha published six compiled manga volumes so far, with the latest released on July 9. Studio Gonzo adapted the web manga into a 13-episode short anime, which premiered in April 2018. Each episode had a runtime of seven minutes. Additionally, it has received a stage adaptation that is currently opening at Tokyo until the end of July, followed by Osaka from August 11 to 12. The TV anime series was simulcast in the west by Crunchyroll and FUNimation under its English title Space Battle Ship Tiramisù. Airing Mondays 25:00 (Tuesdays 1:00 a.m.) via Tokyo MX, followed by Sun TV and BS11 starting October 1 (October 2 midnight). Event on September 29 w. cast members. I can't wait. Subaru Beyond looking godly.